What Is the Excess Shelter Allowance When Filing a MassHealth Application in 2013-2014? The $1,939 in income currently allowed for the community spouse can be increased if the community spouse’s housing expenses are high. That increase is known as the Excess Shelter Allowance. If the community spouse’s housing expenses are more than 30% of the MMMNA, (i.e., 30% of $1939, which comes to $582), then the additional income needed is referred to as the Excess Shelter Allowance, and ends up being an additional income allowance for the community spouse. When is a Community Spouse Allowed to Make Disqualifying Transfers of Assets without Adversely Affecting the Institutionalized Spouse? Under federal Medicaid laws and MassHealth regulations, disqualifying transfers of assets (which are usually gifts or below-market sales) disqualify not only the person who makes those transfers, but also that person’s spouse. A prenuptial agreement or postnuptial agreement has no effect on the required disqualification imposed on MassHealth applicants under federal Medicaid law. Any disqualifying transfers of assets made by a person are problematic because they can disqualify that person’s spouse for the next 5 years, which is the lookback period currently in effect for MassHealth. Therefore, gifts should not be made if a nursing home stay and MassHealth application are likely in the near future, and should especially not be made during the MassHealth application process. The month after a MassHealth approval for an institutionalized spouse, however, a different set of rules applies. At that point, whatever the community (i.e., at-home) spouse does with real estate and other assets is not treated as having been done by the institutionalized spouse. 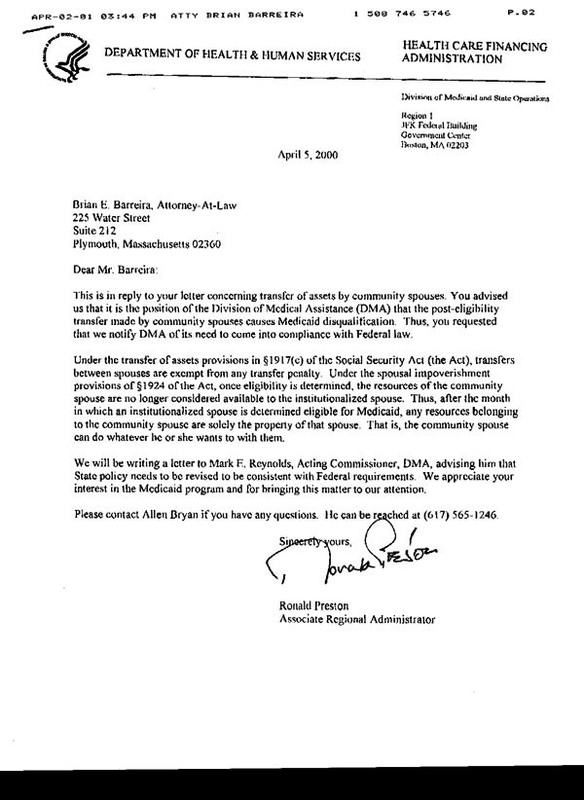 This letter I received in 2000 from the federal government agency overseeing the Massachusetts MassHealth agency confirms that a community spouse may transfer assets the month after MassHealth approval of the institutionalized spouse. Many aging clients are concerned that, after a lifetime of hard work to acquire and maintain the family home, the house could be lost if they are among the unfortunate but growing number of persons who spend the final months of their lives in nursing homes. The urgency of transferring the home well in advance of institutionalization became an issue with the implementation of the Medicare Catastrophic Coverage Act of 1988 (MCCA) and has grown with each change in the law. In general, any transfer to a person within 36 months of applying for Medicaid and any transfer to or from a trust within 60 months could disqualify a Medicaid applicant. Further, OBRA ‘93 authorized states to disqualify persons for transfers not only for the portion of Medicaid that pays for nursing home care, but also for home health care, personal care services, or community supported living arrangements. (1) Safe harbors, however, have been created for four categories of transfers, and other categories may exist under state regulations or practice. Due to the disqualification period, these alternatives should be considered before more creative planning techniques are explored. Estate planning and elder law attorneys can sometimes be confronted with clients whose sole wish is to preserve the home for others, to the exclusion of self-protection concerns. Moreover, elderly persons sometimes consult lawyers who do not specialize in estate planning and elder law, but who nevertheless comply with the client’s wishes to place the home in someone else’s name with little or no advice about the Medicaid or tax ramifications. Proper professional counseling involves much more than simply deeding away the client’s home when the client requests it, as clients are often unaware of all the tax issues involved or their own future options or needs, such as home care or assisted living. In advising clients regarding transfers designed to permit clients to become eligible for Medicaid, attorneys face section 4734 of the Balanced Budget Act of 1997 as a possible problem. That law makes giving advice about Medicaid planning a crime if the disposition results in a period of Medicaid ineligibility. In 1997, in response to a lawsuit filed by the New York State Bar Association, the U.S. Attorney General indicated that the Department of Justice would not defend the constitutionality of the law or enforce it. (2) The final judgment entered in that case declaring the law unconstitutional applies only to a limited number of attorneys. Thus, the possibility of the enforcement of this law remains, although the likelihood appears remote. That such a law was enacted in a bill that also provided tax deductions for long-term care (LTC) insurance should be sufficient notice that Congress discourages transfers of assets and encourages the purchase of LTC insurance. A growing number of estate planning and elder law attorneys believe that the issue of long-term care is first and foremost an LTC insurance issue, and that the insurance should be explored before legal maneuvers are contemplated. Persons with Alzheimer’s disease who can no longer remain at home run the risk of an extended nursing home stay, reportedly averaging eight to nine years. With such a potential long-term care cost, how can thoughtful tax planning ever be done without factoring LTC insurance into the process? It is difficult for a client to make large gifts if the remaining assets will possibly be insufficient to meet the client’s foreseeable needs. Unfortunately, many persons rationalize not purchasing LTC insurance because of the possibility that the insurance may never be needed. In the states of Connecticut, New York, Indiana and California—under a national program called the Partnership for Long-Term Care which was initiated by the Robert Wood Johnson Foundation—various amounts of assets are exempt for Medicaid purposes for persons who have LTC insurance policies that meet state certification standards. (3) Accordingly, persons in those states should have ample reason to look at insurance as a way of preserving their homes. Further, in Massachusetts, particular LTC insurance policies exempt the home from the imposition of a lien when an application for Medicaid is made; the same policies also exempt the home in Massachusetts from an estate recovery claim after the applicant’s death if the Medicaid application is handled properly. For persons who do not have sufficient LTC insurance, Medicaid transfer restrictions can adversely affect the home of an elder who does not wish to give up any current control. The risk of making a transfer that allows a return of the asset to the original transferor is that the law will change retroactively and eliminate the efficacy of the transfer. This result has occurred twice in the trust area. In recent years, many persons have been sold (literally, in the case of many trust mills) on the notion of placing their homes in revocable trusts to avoid probate. Although a home is normally considered an exempt asset for Medicaid purposes, the transfer of a home to a revocable trust can be worse than taking no action at all, because any asset in a revocable trust (including a home) is treated as a countable asset that must be sold and its proceeds spent. In addition, a transfer to others from a revocable trust would be subject to a five-year lookback period, but a transfer from the client directly would be subject to only a three-year lookback period. For these reasons, elder law practitioners often find themselves in the position of revoking trusts that were sold without full explanation of how the trust would be treated for Medicaid purposes. The transfer of a home to a revocable trust would be advisable if a person has already been receiving Medicaid benefits for which a state claim for recovery of amounts paid would be made after the person’s death against the probate estate. Avoiding probate in this situation may avoid the estate recovery claim in some states, because if there is no probate estate, there is no estate recovery. Upon applying for Medicaid, the fact that the home can be returned from a revocable trust to the client is fatal. To be protected, the home must not be returnable to the client. While many of the transfers that accomplish such protection are subject to a period of Medicaid disqualification, some transfers to spouses, children, and siblings can be made even after a nursing home stay has begun. The first and most commonly-used safe harbor is a transfer of the home to the person’s spouse. A jointly-owned home would be considered an exempt asset if one spouse applies for Medicaid. It is usually advisable, though, not to leave the home in joint names when one spouse enters a nursing home, for if the community spouse (i.e., the non-institutionalized spouse) were to predecease the institutionalized spouse, the home would end up in the institutionalized spouse’s probate estate and would be subject to an estate recovery claim. The transferor-spouse could reserve a life estate in the deed, but such a reservation could unduly complicate any sale of the home which the non-institutionalized spouse might wish to make during the transferor’s incompetence. Not only would the signature of the transferor (or someone acting in a fiduciary capacity for the transferor) be required, but the transferor could be legally entitled to a portion of the sale proceeds based on the actuarial value of the life estate. It would seem, then, that a full transfer should often be made to the person’s spouse if a nursing home stay has begun or appears imminent. A gift to a spouse is free of gift tax with one notable exception: if the transferee is not a U.S. citizen, a gift in excess of $117,000 (as of 2005) results in a federal gift tax. Under IRC Section 1041, the transferee receives the transferor’s basis, and no gain or loss is recognized on the transfer, except if the spouse of the individual making the transfer is a nonresident alien. From a family standpoint, this transfer may end up being fruitless if the institutionalized spouse will receive the home under the community spouse’s will. The community spouse receiving the home should therefore execute a will that gives the transferor a life estate or the equivalent. To protect any income generated by the home during a stay by the transferor in a nursing home, the life estate could be limited to the right of occupancy. Until recently, it was uncertain whether the community spouse could take any further steps to preserve the home, including making further transfers or limiting the institutionalized spouse’s inheritance rights. Under the recently disclosed national position of the Health Care Financing Administration (HCFA) in letters from regional offices to Medicaid administrators in Idaho and Massachusetts, the spouse remaining in the couple’s home is permitted to take any action with respect to the home and other assets beginning in the month following the institutionalized spouse’s eligibility for Medicaid. For some married couples, sometimes both tax planning and Medicaid planning should be attempted, and it is desired to use the applicable credit amount of the institutionalized spouse. It sometimes can be advisable to make a transfer of the home to the institutionalized spouse prior to making a gift of the home to others. The possibility of interspousal transfers maintains the possibility of such tax planning. The major step married couples should take in advance to keep transfer possibilities available is to execute durable powers of attorney with specific gift-giving powers, including the power to self-deal. Without such documents in place, a state court proceeding could be necessary to authorize gifts by an incompetent spouse. Married couples where one spouse has a terminal illness should consider the use of a testamentary trust, which is exempted from the onerous Medicaid trust laws in many states. If the home is owned by the first spouse to die, and is left in a discretionary testamentary trust for the benefit of the surviving spouse, the home may then be preserved if the surviving spouse ever requires nursing home care. Because Medicaid is a federal-state program, differences in state laws can cause different outcomes in almost any transfer suggested in this article. In the context of a discretionary testamentary trust for a surviving spouse, for example, two state law factors could minimize or eliminate its value. First, in a community property state, the surviving spouse may be deemed to own one-half of all of the married couple’s assets. Second, a state that has chosen to administer its Medicaid program under the so-called 209(b) option can use the more restrictive Medicaid eligibility requirements in effect prior to the implementation of the Supplemental Security Income (SSI) program. In the case of a discretionary testamentary trust, IRC Section 1014(e) can become an important consideration. Although Section 1014(e) denies a step-up in basis for assets that are given to a person who then dies within one year of the gift, this prohibition is specific to situations where the assets must be returned to the gift-giver. The discretionary nature of the trust should allow a complete step-up in basis as of the deceased spouse’s date of death for capital gains tax purposes. Often overlooked in the estate tax planning and probate avoidance processes is how a revocable trust established by a now-deceased spouse is viewed if the surviving spouse applies for Medicaid. A funded trust that avoided probate is considered completely available for the surviving spouse’s care. Consequently, funding a revocable trust for the sole purpose of avoiding probate can place a surviving spouse in a worse position than if a testamentary trust had been established in the deceased spouse’s will and probate avoidance had not been accomplished. Permissible transfers to or for a blind, disabled, or minor child. The second safe harbor is a transfer of the home to a transferor’s child who is blind, disabled, or under age 21. If the child is a minor, however, probate problems could result if the child predeceases the transferor or if the family wishes to sell the home. If the child is blind or disabled and is receiving governmental or charitable benefits, the benefit program should be reviewed prior to any transfer of the home, to determine whether the child’s eligibility for the benefits could be adversely affected by receipt of the home. In particular, recent changes in the SSI law impose transfer disqualifications and thereby limit the ability of a recipient to receive the home as a gift and take further action to preserve this asset. A transfer of the home can be made to a special needs trust for the sole benefit of the disabled child instead of directly to the child, so long as the trust provides for post-death reimbursement to the state for any Medicaid benefits furnished to the child. Given the vagaries of state administrative interpretations of federal Medicaid law regarding special needs trusts, it is essential that the state regulations, practices, and procedures be carefully reviewed. Permissible transfers to a sibling. The third safe harbor is a transfer of the home to a sibling who has an equity interest in the home and who resided there for at least one year prior to the transferor’s institutionalization. This safe harbor may apply even if the sibling’s ownership interest emanated from the transferor after the institutionalization had occurred. It seems possible that even a negligible or contingent ownership interest, such as a vested remainder subject to divestment, could be treated as an equity interest. Because of this safe harbor, siblings should consider co-owning and living in a multi-family house, which could qualify as each sibling’s home. Any sibling could then maintain ownership right up to the time a transfer becomes necessary or desirable, as long as the transfer is then made to the non-institutionalized sibling. Permissible transfers to a caregiving child. The fourth safe harbor is a transfer of the home to a transferor’s child who resided in the home for at least two years prior to the institutionalization and provided care which allowed the parent to remain at home. The child must have lived in the home during this period, and the care must have been of the type that kept the client at home. Because the state is the arbiter of whether the child’s care prevented institutionalization, this transfer option cannot be relied upon fully without a thorough review of the facts of the case. The child would be well-advised to keep detailed records after moving in with the parent, and a prompt change of the child’s voter and automobile registration can later be helpful in proving residency. Any state Medicaid regulations that may have been promulgated and the state agency’s practice should be carefully analyzed to determine what information the child will be required to prove. In Massachusetts, for example, the residency requirement is two years, but the care requirement can sometimes be less. Children who move in with their parents frequently have a minimal amount of time, energy and intellectual capital for anything other than caregiving, but they should consult with an elder law attorney soon after they move in to learn what planning options exist in their circumstances, especially if the child is giving up significant employment income. In some situations, a written personal services or life care contract between the parent and the child may be appropriate, despite the income tax issues involved in the receipt of the home for future services. Despite the broad parameters of federal law, state Medicaid agencies are free to interpret the federal law. They are also free to misinterpret the law with impunity if HCFA, which supposedly oversees the implementation of Medicaid law by the states, chooses to look the other way. Unfortunately, the U.S. Supreme Court recently eliminated the possible alternative of private plaintiffs filing qui tam actions against states in Vermont Agency of Natural Resources v. U.S. ex rel. Stevens. (4) Therefore, the vagaries of state law, state regulations, and state practices and “policy” should always be a major consideration, and may present a fifth safe harbor. One such example is California, where a self-declared intention to return home somehow renders the home exempt from a disqualification period upon a subsequent transfer. The state can also allow a transferor to become eligible for the Medicaid program if not doing so would “work an undue hardship.” When counseling a client who has been denied Medicaid benefits because of a disqualifying transfer, state regulations should be consulted. One possible reading of the law would allow any transfer of the home, as a person would “qualify” for Medicaid even if such person owned a home, and the transfer thus would not be necessary to qualify for Medicaid eligibility. Under this reading of the law, if the Medicaid issue was not brought up or thought about by the client or the attorney, this exception in the law could be used. This reading, however, appears to contradict other provisions of the law, which permit only certain transfers, and hence may never get off the ground, as the attorney would probably then be required to testify under oath about what would appear to have been irresponsible counseling or malpractice. Any other type of transfer can temporarily disqualify a Medicaid applicant based on the amount transferred. This disqualification period will be short if the uncompensated value of the home (and other transferred assets) would have covered a short period of nursing home care. States are required to implement the disqualification period by calculating the average monthly cost of private nursing-facility services at the time of application, but HCFA has done little or no monitoring of state activity on this front, and states routinely ignore the literal requirements of federal law. The disqualification period can extend indefinitely in some circumstances. One trap for the unwary is that filing a Medicaid application too early can result in a long disqualification period, whereas an application that is filed at the correct time can result in the transfer being disregarded. A transfer that falls outside the Medicaid lookback period, which is five years for many trusts and is three years for non-trust transfers, is safe. The disqualification period begins to run on the date the assets are transferred beyond the reach of the transferor. The sooner any transfer is made, the greater its preservation value. The major risk inherent in the transfer is that the home may have to be sold by the transferees and the proceeds used for the moral obligation of paying for the costs of any care required during the disqualification period. If the transferor is not in failing health, however, it may be possible to avoid this risk by purchasing an LTC insurance policy which covers the disqualification period. There is no reason that preserving the home need be an all-or-nothing proposition, even in late long-term care planning. Just as a partial amount of funds can sometimes be preserved, so too can a partial interest in a home. For example, a transfer of a home into the joint names of the current owner and another person may be deemed to be a transfer of only one-half of the value of the home. It may also be possible to apply valuation discounts in such a case on subsequent transfers. A lawyer drafting documents that effectuate a transfer of the client’s home should always remember that it is the client who is supposed to be represented, not the transferred asset. If a transfer causes a Medicaid disqualification period, the drafter should always analyze how to undo the ineligibility or how to finance the private payment of nursing home costs during such time. If a partial cure of ineligibility may not be possible in a particular situation, then the initial plan should include transfers of partial interests or LTC insurance. If Medicaid concerns are present, one of the most common types of transfers is a deed of the home subject to a reserved life estate. In such a case, IRC Section 2036 will unquestionably apply. For many families, this tax result would be beneficial because the home would be includable in the transferor’s gross estate upon death and would receive an accompanying step-up in basis for capital gains tax purposes under IRC Section 1014. Consequently, any appreciation in the value of the home from the date of its purchase to the date of the transferor’s death would escape capital gains taxation in the hands of the transferees. If a married couple were to transfer their home and retain a joint life estate, under IRC Section 2036 each spouse should be treated as a 50% owner of the transferred property. Accordingly, a joint transfer may result in minimizing estate or inheritance taxes while allowing the transferees to receive the desired step-up in basis. Because a life estate could be valued actuarially and treated as an asset of a transferor for purposes of Medicaid eligibility, another option that merits consideration is an unrecorded use and occupancy agreement. Such an agreement may not fully protect the transferor’s right to live in the home, but it should achieve the same estate tax and capital gains tax results as a reserved life estate. If the transferor makes an outright gift of the home and continues to live there without paying rent, the IRS can treat it—under IRC Section 2036—as includable in the transferor’s gross estate as a life estate retained via agreement. (6) The transferees should always consider taking this position upon a post-death sale. Unfortunately, a departure by the transferor from the home could be deemed a release of that life estate, and under Section 2035 the step-up in basis would be available only if the transferor died within three years of this deemed release. The transfer of a home subject to a life estate is a disqualifying transfer of the remainder interest for Medicaid purposes. Despite the requirement of a federal gift tax return under Chapter 14 of the Internal Revenue Code reporting the full fair market value of the home as a taxable gift, a discounted gift is deemed made for Medicaid purposes based on actuarial values. (7) For this reason, as well as for the capital gains tax ramifications, a transfer of the home subject to a reserved life estate is often a much better move than is an outright deed. The additional advantage of a reserved life estate is that the transferor would be assured of having a home despite anything the transferees might do or in spite of any other occurrence, such as the death, divorce, or bankruptcy of one or more of the transferees. In case the transferor requires a long-term stay in a nursing home, the transferor may wish to limit the life estate to the right of occupancy, so that during that time rental income from the home could be collected by and for the benefit of the transferees. If the life estate is not limited in this way, any rental income would be deemed to be the transferor’s property; it would then have to be spent for the transferor’s care under the spend-down provisions of the Medicaid program, and would therefore effectively be lost. State law should be reviewed to determine if a life estate can be the subject of partition proceedings, as well as if sale proceeds must be divided based on the actuarial life estate and remainder values. Under Massachusetts law, for example, a petitioner could intervene on behalf of the life tenant and petition the court for a sale so that the income from the invested proceeds could be used for the support of the life tenant. (8) Presumably, any deed creating a life estate could specify such a result upon a sale during the life tenant’s lifetime. The reserved life estate method vests the remainder interest in the transferees, and the transferor will have no further control over who will eventually inherit the home. Three problems exist with this loss of control. First, if one of the transferees were to predecease the transferor, the remainder share of that transferee in the home would end up passing under the transferee’s will or by intestacy. If, under the will or applicable intestacy laws, the transferee’s share of the home then returns to the transferor, the transferor would then be required to take further action, which would begin the running of another possible period of disqualification from the Medicaid program. This problem can sometimes occur if a transfer is made to children as tenants-in-common, and one of them who has no spouse, no issue and no will predeceases the transferor. Second, the transferees may simply give away their share, by deed or will, to someone to whom the transferor may not have wished to make any gift. Third, a transferee’s ability to ultimately receive the benefit of the remainder interest may be adversely affected by such person’s bankruptcy, disability, or divorce during the transferor’s lifetime. To eliminate such problems inherent in any deed of a remainder interest with a reserved life estate, the transferor may wish to include in the deed the retention of what is known as a “special power of appointment” (SPA). By use of the SPA, each transferee would have a vested remainder subject to divestment. Under the SPA, the transferor would be able to redistribute the remainder interest among a group of identified beneficiaries. Under IRC Section 2038, such an ability to redetermine the transferees would receive the same estate and capital gains tax treatment as under IRC Section 2036, although it does not eliminate the need to file a gift tax return. The SPA would allow the transferor the opportunity to redetermine who ultimately inherits the home. This flexibility would help eliminate the possibility that once an inheritance had been secured, one or more of the transferees would discontinue helping or visiting the transferor. More importantly, the SPA allows the transferor future flexibility to deal with the possible death, divorce, or bankruptcy of one or more of the transferees. A meticulous conveyancing lawyer may require proof that the SPA was not exercised by will. In such a case, the transferor’s will may have to be probated, perhaps solely for this reason. This complication can be eliminated by language in the deed which causes a conclusive presumption of non-exercise of the power of appointment by will or codicil if notice of the establishment of probate proceedings is not recorded in the chain of title within a certain time frame after the transferor’s death. At the time of executing any such deed, the transferor may also wish to execute a durable power of attorney under which one or more of the transferees could later release the transferor’s life estate or SPA. This power of attorney would allow a transferee whom the transferor does not wish to favor financially, but upon whose judgment the transferor relies, to step into the transferor’s shoes and take corrective action if necessary or desirable because of future changes in family circumstances or in federal or state law. Transfers to irrevocable grantor trusts. All the transfers described so far do not allow the transferor to make full and unquestionable use of the transferor’s $250,000 capital gains exclusion under IRC Section 121. One commentator (9) has proposed that the retention of an SPA in a deed results in the power holder being treated as the owner of the premises for IRC Section 121 purposes, but there is an absence of case law directly on point. If IRC Section 121 is a concern, the better planning choice would be an irrevocable trust that intentionally triggers the grantor trust provisions of the Internal Revenue Code. Because capital gains may be allocable to principal under state law, care should be taken to ensure that the trust is not deemed a grantor trust as to income only. A power over principal should be considered, such as a power to make distributions of principal to charity and/or issue. Administrative powers—such as borrowing without adequate security or the power to replace the home with assets of equivalent value—could also be considered, but could be misinterpreted by the state Medicaid agency, whose personnel often do not have the same level of trust training and sophistication as do IRS auditors. One other way to preserve the home while doing estate and gift tax planning would be to transfer the home to a qualified personal residence trust (QPRT). Practitioners should not, however, recommend a QPRT with a very long term without taking into account the possibility that the client may leave the home to live with a relative or to reside in a nursing home. In such situations, the annuity provisions of the QPRT which would take effect would, in many cases, necessitate a sale of the home and cause the expenditure of much of the proceeds. The legal authority of someone other than the homeowner to make a transfer of the home is always an important issue to be addressed. In the absence of a durable power of attorney which contains explicit gift-giving provisions, a state court procedure may be available to obtain authority for a particular type of transfer. Prior to any transfer, the governmental benefits other than Medicaid or homestead exemptions that the client may already be receiving or hoping to receive should be reviewed. Moreover, the lawyer should ascertain whether the transferor has retained a full insurable interest in the home. If not, the homeowner’s insurance policy and any other similar policy should be amended to ensure that the proper person or entity is named in the policy. Upon any completed gift, a federal gift tax return must be filed on or before April 15th of the calendar year following the gift. Even when it seems clear that no completed gift has been made—such as when the transferor retains an SPA in a trust or deed—the taxpayer is usually required to file a gift tax return, and civil and criminal penalties could be imposed by the IRS if such a return is not filed. Should an Appeal Be Filed If a Denial for MassHealth Long Term Care Is Received? Usually when a MassHealth denial is received, it makes sense to file an appeal within 30 days of the denial date. To have proof that you appealed timely, it is advisable that the appeal be sent via fax to the Board of Hearings. In many cases, receiving a MassHealth denial means that the MassHealth eligibility worker requested something (known in MassHealth lingo as a “verification”) and did not receive it on a timely basis. In those situations, submitting a missing verification during the following 30 days is treated as a new application for MassHealth. Since a MassHealth application is retroactive for no more than 3-4 months, it is important to determine whether the new application will go back far enough. If not, an appeal should be filed, and if all of the missing verifications are submitted at an appeal, the original application date will be preserved. If a denial is received for any reason other than missing verifications, filing an appeal may or may not help the situation. If there were disqualifying transfers, sometimes an appeal would be futile and a return of the assets to the MassHealth applicant makes more sense. Sometimes, the denial refers to excess assets and there are financial steps that can be taken to “spend down” the excess assets. What I have been seeing a lot of lately is a denial that is the result of an overworked MassHealth eligibility worker’s mistake. This is also a just plain ridiculously stupid MassHealth process now in place, where you send your documents to MassHealth on a timely basis, then MassHealth sends the documents out to be scanned for electronic storage and doesn’t let the eligibility worker know when the documents were received, so the worker issues a denial because the worker doesn’t receive the scanned documents back on time. When a denial is received and you file an appeal, MassHealth’s own regulations require that most appeals be heard and decided within 45 days. Unfortunately, at present, it now takes the Board of Hearings 4-5 months just to schedule an appeal. Nursing homes, which are not being paid during that time, are sometimes filing lawsuits against MassHealth applicants and their families before they even get a chance to have their appeal heard. Thus, when you receive a MassHealth denial for any reason whatsoever, attaining the services of an elder law attorney within the following 2-3 weeks is now extremely important. It shouldn’t be that way, but the MassHealth system seems to be out of control at this point. When Are a MassHealth Applicant’s Intentions Considered in Determining Whether a Disqualifying Transfer Occurred? There are many exceptions to disqualifying transfers in federal Medicaid law that the MassHealth program has been required to implement. If a potential disqualifying does not fit into the categories of permissible transfers, then MassHealth is required to determine what the MassHealth applicant’s intentions were when the transfer occurred. One exception to a disqualifying transfer occurs when the MassHealth applicant had made the transfer exclusively for a purpose other than obtaining MassHealth eligibility. This one situation where ignorance of the law can be an excuse for what was done. Unfortunately, anybody can claim that he/she didn’t know about the law, so hearing officers expect a compelling case to be made, and if there is even a hint of MassHealth planning or knowledge, they can easily rule against the MassHealth applicant. Another expectation to a disqualifying transfer involves an attempt to receive fair market value or other valuable consideration. Under federal Medicaid law and MassHealth regulations, the past five (5) years of a MassHealth applicant’s assets are scrutinized to determine whether the applicant has made any disqualifying transfers. As the term indicates, a disqualifying transfer makes the MassHealth applicant ineligible for MassHealth. A disqualifying transfer is usually a gift (or something similar to a gift) that the MassHealth applicant made in the previous 5 years. Any transfer that occurred more than 5 years ago (even just 5 years plus one day ago) is outside the Medicaid lookback period, and cannot be considered a disqualifying transfer. A disqualifying transfer, however, is not limited to gifts. To put it as simply as possible, if the MassHealth applicant had ownership of anything on one day and did not have the same ownership the next day, a disqualifying transfer may have occurred. Thus, any sale for less than fair market value can be a disqualifying transfer. Paying a child or other relative for services, or even reimbursing them for expenses, can be treated by MassHealth as a disqualifying transfer. Unrepaid loans can also be considered disqualifying transfers. Sometimes the lawyers representing MassHealth make unfair stretches of the law. For example, should a bad investment be treated as a disqualifying transfer. In one case that I handled that took 5 years to win, the MassHealth lawyers saw that a MassHealth’s applicant’s husband had made a risky investment that dropped in value. Those lawyers attempted to convince a judge that he should have foreseen that the investment would drop in value, and therefore he had essentially made a disqualifying transfer. Fortunately, a full 5 years after the MassHealth application had initially been filed, a Superior Court judge overturned the decision of a fair hearing officer who had sided with MassHeath’s silly argument. What Is the Excess Shelter Allowance When Filing a MassHealth Application? The $1,838 in income currently allowed for the community spouse can be increased if the community spouse’s housing expenses are high. That increase is known as the Excess Shelter Allowance. If the community spouse’s housing expenses are more than 30% of the MMMNA, (i.e., 30% of $1838, which comes to $551), then the additional income needed is referred to as the Excess Shelter Allowance, and ends up being an additional income allowance for the community spouse. For some spouses, the increased income allowance can mean an increase in the community spouse resource allowance, which is the total amount of assets that the at-home spouse is allowed to keep.